A number of people were seriously injured in the accident, and as well as Robert Cottam, four others are known to have died: Alexander Malcom; Henry Horn Jr.; John Donald; and John Burton, the train’s guard. At some point after this, the coin was engraved with the names of one of the accident’s victims, presumably as a memory of them. ‘Fearful Accident to the “Flying Scotchman.”, Alnwick Mercury (31 March 1877). 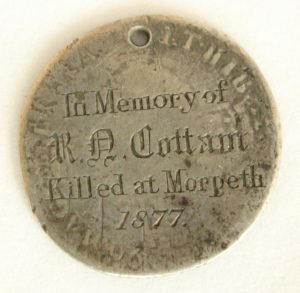 ‘The Railway Accident at Morpeth: Adjourned Inquest – The Verdict’, Alnwick Mercury (14 April 1877). This post was written by Daniel Rose-Jones. The item was discovered as part of an audit kindly funded by the John Ellerman Foundation.